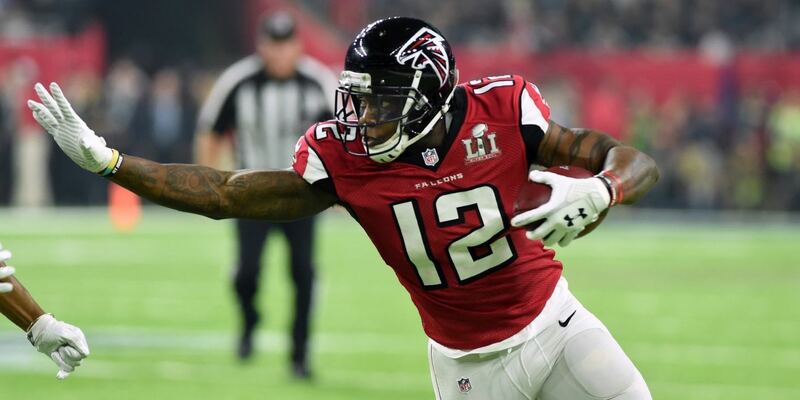 DALLAS - March 14, 2019 - PRLog -- Black Diamond PR Firm announces Mohamed Sanu, wide-receiver for the Atlanta Falcons, as the newest client to join their 2019 representation roster. Sanu started his football career playing as a triple-option quarterback for South Brunswick High School before attending Rutgers University as the first-ever true freshman to start as wide receiver. During his time at Rutgers, Sanu won Most Valuable Player honors at the 2009 St. Petersburg Bowl, was a consensus preseason All-Big East wide receiver, and caught passes for 2,263 yards, 19 touchdowns, and gained 2,019 all-purpose yards. Following his successful college career, Sanu was drafted to the NFL in the 3rd round with the 83rd overall pick to the Cincinnati Bengals, where he played for 3 years. In 2016, Mohamed signed a five-year contract with the Atlanta Falcons, where he touted 59 receptions for 653 yards and 4 touchdowns in his first year. The Falcons reached Super Bowl LI in the 2016 season, where they faced New England Patriots. During the Super Bowl, Sanu had two receptions for 25 yards. On and off the field, Mohamed Sanu's dedication and heart can be seen. He is deeply dedicated to his family and enjoys spending time with his son. He actively gives back to his community in various forms as well as supports local charities in the Atlanta, New Jersey, and New York areas. Mohamed leads his "Sanu's Crew" which benefits the Embrace Kids Foundation, as well as visits local autism centers, raises money for cancer research, and coaches youth football camps. With so much going on in his professional career, Team Sanu is very excited to be partnering up with Black Diamond PR Firm, which is based out of Dallas, Texas. "There is so much I have done and so much I have yet to do," said Sanu. "I have never had the team to help tell my story as well as help create new ones, so I am excited to finally have that team in Black Diamond PR and I can't wait to see what the future holds!" His agent, Patrick Powell, agrees. "There is nothing more important than exposing your clients to the world, as well as exposing the world to your clients," Powell added. "The art in doing so opens so many doors for my clients as well as for myself. We are excited to kick off a partnership with Black Diamond that renders great success and opportunity." Black Diamond PR Firm is a 12-year veteran in the Public Relations scene, having worked with scores of celebrities and high-profile events over the years. Their sport division kicked off the 2019 year with an impressive list of high-profile athletes. The addition of Mohamed Sanu is a milestone in the eyes of the company's CEO, Brandy Runyan. "Mohamed Sanu is a household name across America when it comes to football," says Runyan. "It means a lot to us to be representing an athlete of his caliber. There is a lot of depth to Mohamed and we're looking forward to sharing his inner passions and initiatives with the public, as well as supporting and elevating his brand." Black Diamond PR Firm is a Full-Scale Public Relations Firm headquartered in Dallas, Texas. BDPR specializes in the Entertainment Industry and proudly represents Authors, Athletes, Artists, Bands, Indie Musicians, Actors, as well as Small Businesses across the United States and internationally. The company has represented countless celebrities, conducted high profile product placement for major events, as well as been integral in building brands globally for enterprises worldwide. In business since 2007, the company prides itself on a perfect blend of "family" service and the highest quality business ethics. The company is a proud PRSA and CMA Member.